This was a wonderful opportunity to see these striking and thought-provoking prints commissioned by AIUK. 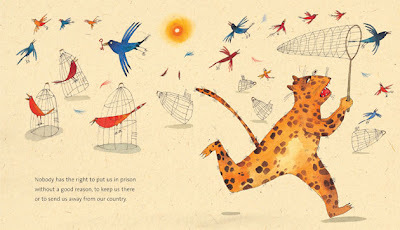 They represent all the rights in the Universal Declaration of Human Rights, each interpreted by a different internationally renowned children’s illustrator. The results are stunning and charming, and definitely for all ages. They were on display during the York Literature Festival 18th – 28th March at St Helen’s church, St. Helen’s Square (opposite Betty’s) in the city centre.